From medieval law and literature to Tudor queens and courtiers, from Stuart royals and rebels to Regency soldiers and social calls, experience the panorama of Britain’s yesteryear. Explore the history behind the fiction, and discover the true tales surrounding Britain's castles, customs, and kings. Visit the English Historical Fiction Authors blog & Facebook page. 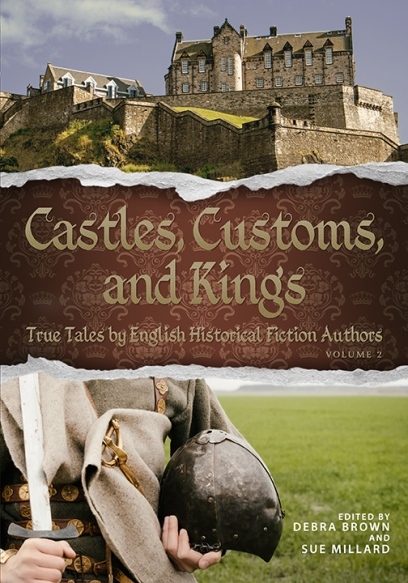 To enter to win an eBook of Castles, Customs, and Kings: True Tales by English Historical Fiction Authors (Volume 2), please leave a comment on this post and include your email address (or an alternate way to notify you if you win). – Giveaway ends at 11:59pm EST on December 8th. You must be 18 or older to enter. I'd be a very lucky girl, indeed, to win this book. Love historical fiction!!! Thanks so much for the chance and sounds really good. This is an exciting giveaway, I loved the first volume! Thanks for the chance to win a copy. This looks like a fascinating anthology which I would love to win please. These are beautiful and informative books to have in any history lover's library. Looks like an interesting book, I'd love to win it. This would be a great reference book for many topics. Thank you for the opportunity. Hi! I like such books. History is the only thing I rely upon while writing my stories. I believe this book will be really useful for me. How will be the winner chosen? What a fascinating book! I love reading about the "interesting" stories in history, and would love to win this book. Thank you for the giveaway, and for featuring it on your blog.